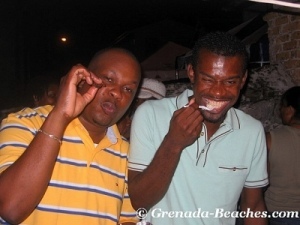 It’s Friday, you’re in Grenada, and you’re a seafood lover, then Gouyave Fish Fridays is the only place you need to be. I was still in San Juan Puerto Rico, and about to start the last leg of my trip to Grenada. I got to talking to this guy and the question Where is the best Grenada hang out on a Friday Night? came up. That’s when I first got the scoop on Gouyave Fish Fridays. Gouyave is a fishing village to the northwest of Grenada, about 45 minutes from the hotel district in the south. 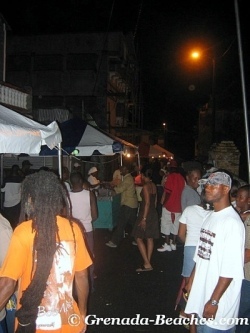 It’s known in Grenada as the town that never sleeps. More fish is caught by Gouyave’s fishermen than anywhere else on the island. Some Gouyave fishermen were even awarded medals by Her Majesty Queen Elizabeth II. So what you need to know is that Gouyave people know their Seafood. 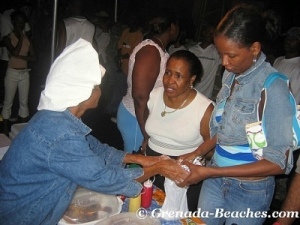 With the introduction of Gouyave Fish Fridays this already lively little coastal town, has become even more lively. The event as the name suggests takes place every Friday, from 6PM – until (normally about 1AM). 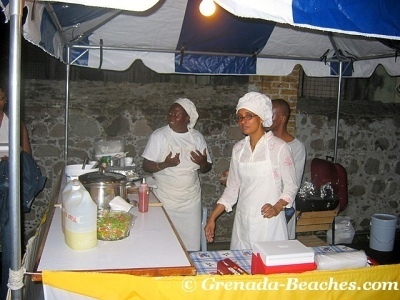 On my last Friday in Grenada I decided to check out Gouyave Fish Fridays. We planned with a few friends to all meet in Gouyave. I did not not want to drive (I wanted to drink, and was still a tad bit uncomfortable Driving in Grenada ) so I asked my buddy to pick us up. We left St. George’s around 7:45PM. On our way to Gouyave we stopped of at Pappy’s shop in the village of Concord to taste some local Grenada Wine and Liqueurs. It’s a nice stop, and all part of the fun driving up on the west coast. Needless to say by the time we arrived in Gouyave around 8:20 PM I already had my buzz going. Here is Mia getting some fry Jacks. Which she totally fell in love with. I think some made it all the way back to the Washington DC. Jacks are quite small, about the length of your palm, and about the width of you two fingers together (some larger some smaller). When fried they are a treat. Just watch out for the bones. You probably won’t find such a wide collection of fresh tasty Grenada seafood like this anywhere else, so do like me … go wild! Sample everything! Be adventurous! Try things you’ve never had, nor heard of before … how else are you going to find out if you love it madly? But Watch out for that hot pepper sauce. It’s a Ball of Fire!!! I put too much on my fried Marlin, and suffered dearly … it took several Carib beers to bring the temperature in my mouth back to normal. 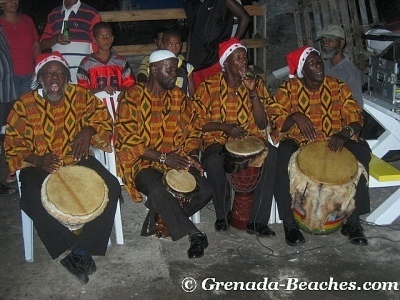 One thing you will quickly discover with Grenadians is that where there’s food, and people … music is sure to follow. We got there in time to catch some incredible drumming. That was a nice complement to the DJ. Gouyave Fish Fridays is still in it’s infancy, and no doubt will blossom into something magnificent. I want to make a point to you if you are a Non Caribbean Visitors to help set your expectations. I believe that Grenada is one of the safest places you will find anywhere to bring your family on vacation. And that Grenadians are as friendly and welcoming as it gets. That said you should know that this is largely a local event, that is patronized mainly by locals. Everyone is welcome to Gouyave Fish Fridays, BUT just know that it is NOT your typical made especially for tourist event . If you are comfortable being in the company of locals, and open to learning about Grenada’s culture you will have a great time. But if you are uneasy about mingling, then you best remain at your hotel. Remember you create your own reality. The event by itself was magnificent, but being with a great bunch of friends made it even more spectacular for me. I say this to encourage you to bring along some friends with you. And the occasional Adult Language. It rained a bit while we were there, but that did not take away one bit from the good times we were having. Gouyave Fish Fridays was a super hang out. After loading up on some Fry Jacks to take away, we left at about 11:00 PM and headed south to Club Bananas (more good times)… our Friday night (or Saturday morning) was just beginning. What’s Your Best Ever Gouyave Fish Friday? If you liked it, then share it with us! Right here!… Let’s hear your favorite Gouyave Fish Friday Story. Heard about the Gouyave fish friday and gave it a try. The road up to Gouyave was not very good, but the food and the atmosphere made up for it.